The Cryonics Institute's Check-In App is a simple personal alarm system that checks if you're all right at scheduled intervals throughout the day. If you don't respond, it alerts your selected friends, family and emergency resources by text message so they can call or check in to make sure all is well. 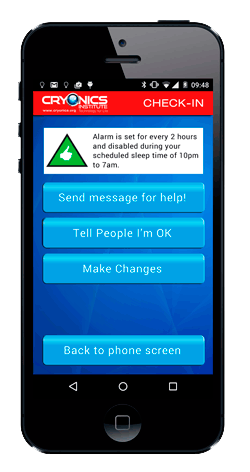 It is ideal for standby notifications, as well as for anyone who wants the peace of mind of knowing a loved one is all right. The app is available on Google Play for 99¢. The CI Emergency Notification app is offered as a Commercial app. This SERVICE is provided by the Cryonics Institute and is intended for use as is. If you choose to use our Service, then you agree to the collection and use of information in relation to this policy, as well as allowing the CI Emergency app to access data and functions on your device. These functions are required for the app to work as intended to automatically send text messages under those conditions set by the App User. Any Personal Information that we collect is used for providing and improving the Service. We will not store, use or share your information with anyone.